Citation: Abdullaiev RYA, Sysun LA, Tovazhnyanska OL, et al. Transcranial dopplerography in acute left-hemispheric ischemic stroke. J Brain Neurol 2018;2(1):8-13. Transcranial dopplerography, Ischemic left-hemispheric stroke, Middle cerebral artery. Stroke is the second most common cause of morbidity worldwide (after myocardial infarction) and is the leading cause of acquired disability . Presence of stenosis of the main arteries of the brain significantly worsens the prognosis and internal introduction of the recombinant tissue plasminogen activator. The developed clinical scales allow predicting the presence of arterial occlusion with an accuracy of 85%. Previous studies have shown high efficacy of intraarterial injection, which increases the degree of intra-arterial thrombolysis [2,3]. – Chronic: more 3 weeks. In case of suspected acute ischemic stroke, the purpose of using CT is: 1) to reveal the rupture of the main arteries of the brain, if any, that can hinder the effect of thrombolysis; 2) to search for the slightest signs of ischemia; 3) to exclude brain tumors, aneurysms of large brain arteries that can mimic a stroke. Compared to un-contrast CT, perfusion CT has a four-fold accuracy in the diagnosis of ischemic stroke, permits differentiation of irreversibly damaged brain tissue from reversibly impaired "tissue at risk” and is used to select patients for reperfusion therapy [5,6]. CT and MR angiography allows to determine the causes and mechanisms of the onset of a stroke, the degree of expansion of the cerebral infarction and the localization of the occlusion of the arteries. These methods can be used to identify the expansion of potential viable brain tissue (semitraum) and irreversible brain damage (core) using CT perfusion and/or diffusion weighting and perfusion weighted MR imaging . In the last 2 decades, along with CT and MRI in the diagnosis of ischemic stroke, transcranial dopplerography is used to determine the site of stenosis of the main arteries of the brain [8-11]. Explored by Brunser et al. have shown that PMD-TCD is validated with CTA for the diagnosis of arterial occlusions in patients with acute ischemic stroke, especially in the MCA, and can be implemented in many ERs that have less access to CTA or MRA. Patients in the middle clinical probabilities of an arterial occlusion benefit from a rapid, low-cost examination performed at the ER, which can discriminate those patients who should be closely monitored and treated more aggressively . The presented literature data demonstrate the relevance of the diagnosis of hemodynamic changes in the basin of the middle cerebral artery in hemispheric ischemic stroke. Transcranial dopplerography assessment of blood flow parameters in patients with left hemispheric stroke, caused by atherosclerosis of the internal carotid and middle cerebral artery. A retrospective analysis of the results of transcranial dopplerography (TCD) of the middle cerebral artery was performed in 104 patients with left hemispheric ischemic stroke (IS) caused by atherosclerosis of the internal carotid (IC) and middle cerebral arteries (MCA). The age of the subjects was 41-80 years, among them 49 (47.1%) men and 55 (52.9%) women. Hemorrhagic stroke, stroke of undetermined etiology, cryptogenic stroke, and bilateral ischemic strokes were excluded. The study was conducted without preliminary preparation of the patient in a supine position. Scanning starts in B mode with visualization of the brain structures from the transtemporal (through the scales of the temporal bone) access. The pyramid of the temporal bone served as a reference for the identification of vessels of the circle of Willis. From the transtemporal access, the internal carotid siphon, middle, anterior and posterior cerebral arteries were visualized. The maximum systolic velocity (Vs), the end diastolic velocity (Vd), average systolic velocity (TAMX), the resistance and pulsativity indexes (RI, PI) in MCA were determined . Among the patients aged 40-60 years, men were 26 (25%), women 21 (20.2%), and at the age of 61-80 years, 23 (22.1%) and 34 (32.7%) respectively (Table 1). As can be seen from the table, IS among women aged 61-80 years was significantly (P<0.05) more often than at the age of 40-60 years. Table 1: Distribution of patients with acute left-sided hemispheric stroke, taking into account gender and age. The control group consisted of 48 patients without cardiovascular diseases, atherosclerotic plaques in carotid arteries of the same age and gender composition. In 90 (86.5+3.4%) patients with acute left-sided hemispheric ischemic stroke, the systolic blood flow velocity in the middle cerebral artery did not exceed 70 cm/s and averaged 56.7 ± 6.6 cm/s. In the remaining 14 (13.5+3.4%) patients systolic blood flow velocity varied within 71-118 cm/s and averaged 87.9 ± 9.3 c/s. Among patients with a reduced velocity of blood flow in 83 (92.2%) cases, according to CT and MRI data, the size of the affected lesion in the left hemisphere varied within 1.0-2.0 cm, in 7 (7.8%) cases was less than 1.0 cm (Figure 1). TCD in triplex mode in 79 (87.8%) cases showed MCA stenosis, which was confirmed in 76 cases with MRI angiography (Figure 2). Figure 1: MRI with ischemic stroke in the left MCR basin (left hypodence zone). 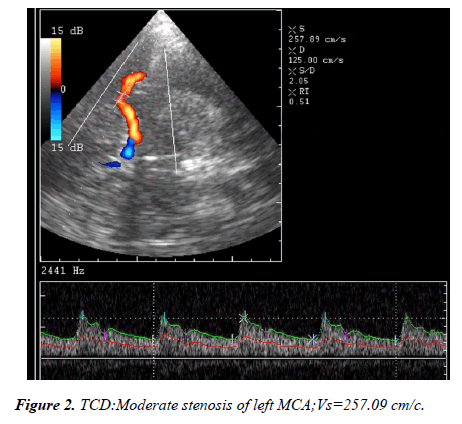 Figure 2: TCD:Moderate stenosis of left MCA;Vs=257.09 cm/c. TCD results were compared in patients aged 40-60 years and 61-80 years on the side of the lesion and the contralateral side (Table 2). Table 2: Hemodynamic parameters in MCA in patients with Ischemic Stroke measured during the first day of the disease on the affected and the contralateral sides, taking into account the age. As can be seen from the table, in patients over 60 years of age there was a decrease in blood flow velocity in systole and diastole, an increase in indices of resistance and pulsation. Vs among patients under 60 years old was 56.7 ± 6.6 cm/s, more than 60 years- 48.5 ± 5.9 cm/s; Vd-19.0 ± 2.8 cm/s and 13.0 ± 2.0 cm/s; TAMX-27.5 ± 4.3 cm/s and 25.2 ± 4.2 cm/s; RI=0.67 ± 0.04 and 0.74 ± 0.04; PI-1.37 ± 0.09 and 1.41 ± 0.08 respectively (Figure 3). Between the age indices, the difference was greatest in magnitude Vd, but it was not reliable. 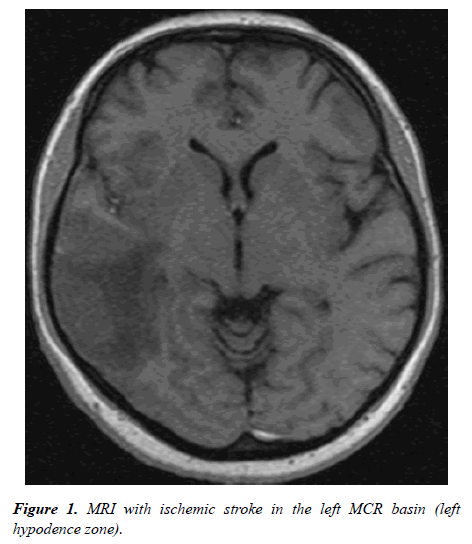 Figure 3: TCD:53 years old men; Left-sided hemispheric ischemic stroke; Vs=56.73 cm/c; RI-0.67; PI-1.39. On the contralateral side, all hemodynamic parameters in MCA were significantly different from the affected side. Vs and Vd was normal (Figure 4: On the contralateral side, the diastolic blood flow velocity between patients <60 and >60 years was significantly different (P<0.05). Figure 4: TCD: the same patient; the contralateral side; Vs=112.98 cm/c; RI-0.57; PI-0.84. A dynamic study was conducted on the 21st day of the disease. In 35 patients, unfavorable course of the disease was recorded; in 3 cases a lethal outcome was recorded. A favorable course was noted in 69 cases (Table 3). As can be seen from the table, the hemodynamic parameters of the blood flow among patients with an unfavorable outcome on the 21st day of the disease did not differ from the results of the first day of the disease (see Table 2). In patients with a favorable outcome, Vs increased by 50-60% of the data for the first day of the disease. The Doppler spectrum of blood flow in patients with an unfavorable outcome was marked by the presence of deep incisors in early diastole (Figure 5). Figure 5: TCD: 64 years old women; Left-sided hemispheric ischemic stroke; Deep incision in early diastole. Vs=48.73 cm/c; RI-0.74; PI-1.41. Table 3: Hemodynamic parameters in MCA in patients with Ischemic Stroke measured during the 21 day of the disease on the affected side. The frequency of visualization of cerebral veins and the systolic blood flow velocity in them in healthy individuals and in patients with hemispheric ischemic stroke on the side of the lesion were compared. In healthy subjects, a large vein of the brain (Galen vein) was visualized in 91.2% of cases, with IS in 96.2% of cases; basal vein of the brain (Rosenthal vein) in 81.3% and in 95.6% of cases; direct sinus in 64.2% and in 92.4% of cases, deep median cerebral vein in 58.4% and in 84.3% of cases, respectively. In healthy individuals, Vs in the deep medial cerebral vein was 12.4 ± 3.3 cm/s, with IS-24.6+3.8 cm/s; in the basal vein of the brain -15.3+2.2 cm/s and 24.6+3.8 cm/s; in the large vein of the brain-19.6+2.3 cm/s and 26.2+2.4 cm/s; in the direct sinus, 23.7 ± 3.2 cm/s and 31.7 ± 2.4 cm/s, respectively (Figure 6). 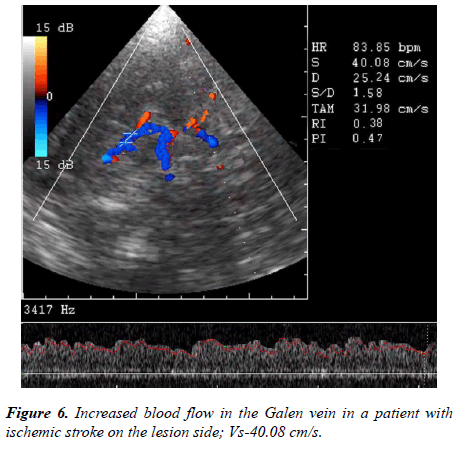 Figure 6: Increased blood flow in the Galen vein in a patient with ischemic stroke on the lesion side; Vs-40.08 cm/s. Cerebrovascular ultrasound is successfully used to determine vascular patency in patients with acute stroke. Transcranial dopplerography can be performed by a trained person at the patient's bedside within a few minutes . Dopplerometric blood flow parameters give information about occlusion, recanalization, and reperfusion following thrombus dissolution, as well as reocclusion. То монитор these critical changes, several grading systems were developed to classify residual flow status in acute stroke patients. As the most widely known system, TIBI (Thrombolysis in Brain Ischemia) and COGIF (Consensus on Grading Intracranial Flow Obstruction) , which is a modification of the TIBI system to TCDI, correlate well with the initial stroke severity, mortality, likelihood of reperfusion, and clinical improvement. The role of transcranial dopplerography in the study of ischemic stroke is shown in previously published scientific papers [16,17]. Dopplerometric monitoring on the 21st day of the disease made it possible to provide us with prognostically unfavorable blood flow parameters. Improved visualization of deep veins, increased blood flow in them was additional indirect signs of brain damage in left-sided hemispheric ischemic stroke. In patients with hemispheric ischemical stroke, stenosis of the middle cerebral artery, a systolic blood flow velocity less than 70 cm/s, an increase in the resistance and pulsation index is often observed. On the contralateral side, in persons up to 60 years of age, the blood flow velocity may be slightly increased in comparison with healthy individuals. Reduction of systolic blood flow velocity, increase in resistance index more than 0.70, pulsative index more than 1.35, presence of deep incision on Doppler spectrum of blood flow in middle cerebral artery are prognostic signs of unfavorable course of ischemic stroke. With ischemic stroke on the side of the lesion, visualization of the deep veins of the brain improves because of the increase in speed in them. The authors declared no potential conflict of interest with respect to the research, authorship, and/or publication of this article. Tomandl BF, Klotz E, Handschu R, et al. Comprehensive imaging of ischemic stroke with multisection CT. Radiographics. 2003;23(3):565-592. IMS Study Investigators. Combined intravenous and intra-arterial recanalization for acute ischemic stroke: the Interventional Management of Stroke Study. Stroke. 2004;35(4):904-911. Singer OC, Dvorak F, de Rochemont RD, et al. A simple 3-item stroke scale: comparison with the National Institutes of Health Stroke Scale and prediction of middle cerebral artery occlusion. Stroke. 2005;36(4):773-776. Allen LM, Hasso AN, Handwerker J, et al. Sequence-specific MR imaging findings that are useful in dating ischemic stroke. Radiographics. 2012;32(5):1285-1297. Allmendinger AM, Tang ER, Lui YW, et al. Imaging of stroke: Part 1, perfusion ct??? Overview of imaging technique, interpretation pearls, and common pitfalls. Am J Roentgenol. 2012;198(1):52-62. Hopyan J, Ciarallo A, Dowlatshahi D, et al. Certainty of stroke diagnosis: incremental benefit with CT perfusion over noncontrast CT and CT angiography. Radiol. 2010;255(1):142-153. Vilela P, Rowley HA. Brain ischemia: CT and MRI techniques in acute ischemic stroke. Eur J Radiol. 2017;96:162-172. Chernyshev OY, Garami Z, Calleja S, et al. Yield and accuracy of urgent combined carotid/transcranial ultrasound testing in acute cerebral ischemia. Stroke. 2005;36(1):32-37. Navarro JC, Lao AY, Sharma VK, et al. The accuracy of transcranial Doppler in the diagnosis of middle cerebral artery stenosis. Cerebrovasc Dis. 2007;23(5-6):325-330. Tsivgoulis G, Sharma VK, Lao AY, et al. Validation of transcranial Doppler with computed tomography angiography in acute cerebral ischemia. Stroke. 2007;38(4):1245-1249. Saqqur M, Zygun D, Demchuk A. Role of transcranial Doppler in neurocritical care. Crit. Care Med. 2007;35(5):S216-23. Brunser AM, Lavados PM, Hoppe A, et al. Accuracy of transcranial Doppler compared with CT angiography in diagnosing arterial obstructions in acute ischemic strokes. Stroke. 2009;40(6):2037-2041. Abdullaiev RY, Sysun LA, Kalashnikov VI, et al. Methodical aspects of dopplerography of the main arteries in the circle of Willis. J Brain Neurol. 2017;1(1). Schlachetzki F, Herzberg M, Hölscher T, et al. Transcranial ultrasound from diagnosis to early stroke treatment–Part 2: Prehospital neurosonography in patients with acute stroke–The Regensburg Stroke Mobile Project. Cerebrovasc Dis. 2012;33(3):262-271. Nedelmann M, Stolz E, Gerriets T, et al. Consensus recommendations for transcranial color-coded duplex sonography for the assessment of intracranial arteries in clinical trials on acute stroke. Stroke. 2009;40(10):3238-3244. Hedna VS, Bodhit AN, Ansari S, et al. Hemispheric differences in ischemic stroke: is left-hemisphere stroke more common?.J Clin Neurol. 2013;9(2):97-102. Akif Topcuoglu M. Transcranial Doppler ultrasound in neurovascular diseases: diagnostic and therapeutic aspects. J Neurochem. 2012;123(s2):39-51.